Residents of St. Petersburg are encouraged to learn about the major hearing aid types on the market and then make an appointment with an audiologist to be fit with the ideal hearing aid for their circumstances. The numerous different styles of hearing aids and the many distinct acronyms employed to refer to them make it hard for novice shoppers to perform their own research. 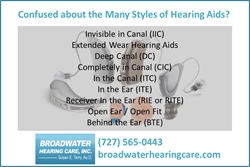 To help buyers make sense of the many styles and the meanings of all the abbreviations, Broadwater Hearing Care recently released a quick reference list online at http://broadwaterhearingcare.com. A side-by-side list of all the major hearing aid types quickly reveals why buyers often have difficulty making sense of the similar names and acronyms. The guide created by Broadwater Hearing Care is one step in the right direction toward clearing up some of that confusion. Having said that, the audiologists at Broadwater Hearing Care really encourage any person, considering a hearing aid purchase not to rely on independent research alone, but rather to make an appointment with a professional. The professional can recommend particular types and models based on the results of your hearing test and some lifestyle questions about where you plan to wear your hearing aid and the sorts of hobbies you routinely participate in. Dr. Susan Terry, Au.D, owns Broadwater Hearing Care, Inc. Dr. Terry received her Bachelor's and Master's Degree in Audiology from Florida State University and her Doctor of Audiology degree from the Arizona School of Health Sciences. She is a fellow of the Academy of Doctors of Audiology, the American Academy of Audiology and the Florida Academy of Audiology. She is a past officer and board member of the Audiology Foundation of America. In 2010 Dr. Terry was awarded the prestigious David P. Goldstein, Ph.D. Outstanding Audiologist Award. Part of the success of Dr. Terry's audiology practice in St. Petersburg comes from her recognition that each person's hearing loss is unique. Dr. Terry specializes in difficult to treat hearing loss and understands the special needs of her patients. About Broadwater Hearing Care, Inc.
Broadwater Hearing Care, Inc. has provided hearing aids in St. Petersburg FL and its surrounding communities for several years. The company offers a full range of diagnostic and preventative hearing healthcare professional services, including hearing aid screening, evaluations, hearing aids sales and rehabilitative and preventative counseling. The staff is dedicated to keeping abreast of the latest improvements in technological advancements in the hearing industry and is committed to offering the most current options to our patients.